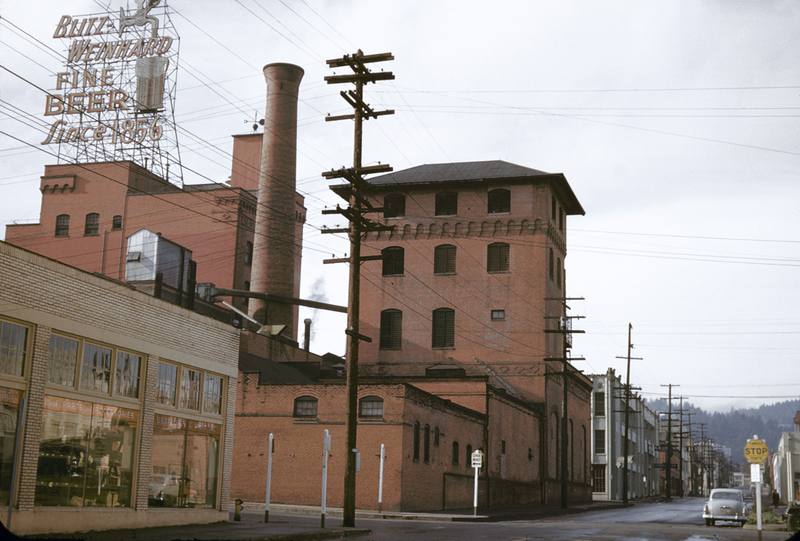 In 1953 the Blitz Weinhard Brewery stood tall over all its gritty neighbors. It’s now dwarfed by today’s high-rise condos and office buildings. 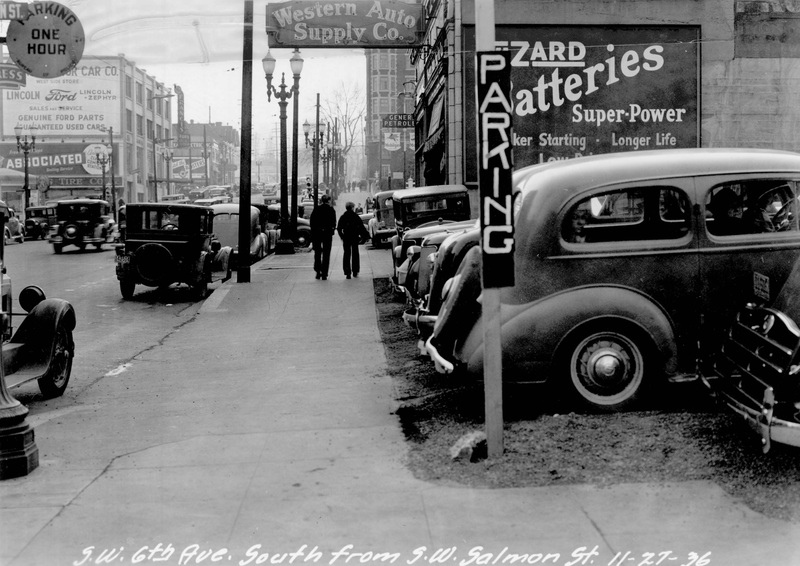 At the corner of NW 11th and Couch, Powell’s City of Books is now on the left where an auto dealership once stood. 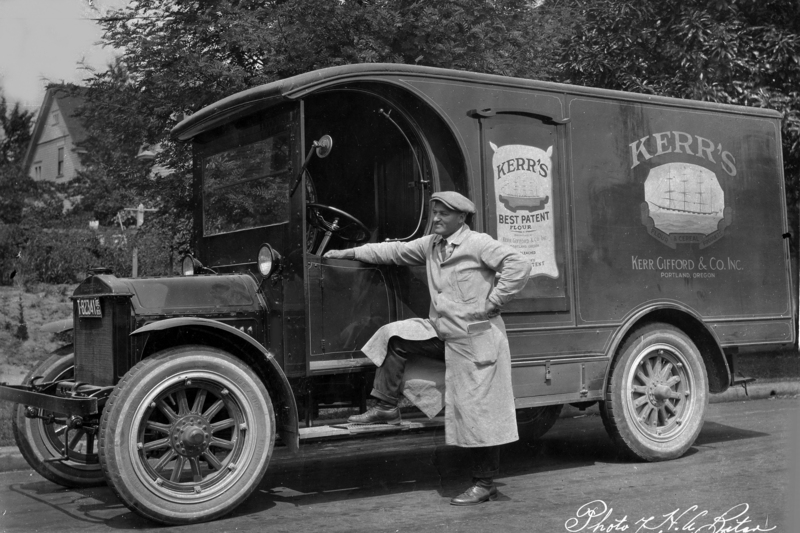 Kerr Gifford & Co. Inc.
VP fan Fred Parks sent this fine, professionally staged photo of his grandfather, Frederick Oliver Parks (1881-1946) and his Kerr Gifford & Co. delivery truck. Mr. Parks lived in a house near SE 37th and Yamhill in the mid-1920s, about the time this photo was taken; that’s a 1924 license plate on a Federal truck. Thanks for the photo, Fred! Kerr Gifford & Co. was sold to Cargill in 1953. Kerr Grain was founded in 1954 and is known as Kerr Pacific Corp. today. They are still headquartered in Portland, and they still use a sailing ship in their logo. Except for the Ambassador Apartment Building in the distant center, it’s hard to identify this as Portland. A half-block parking lot now covers the ground on our immediate right, while the Gus J. Solomon United States Courthouse is just out of view beyond that. Everything on the left is replaced by shiny high-rises. The building at far left of the previous post was the magnificent old Portland High School. 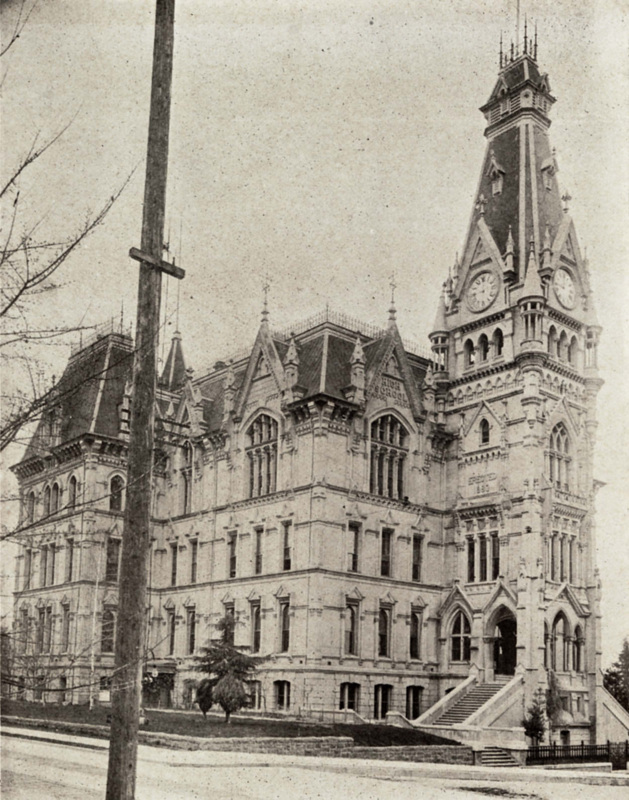 Completed in 1885, it stood at SW 14th and Morrison until it was demolished in 1929. The school was renamed Lincoln High School in 1909 and moved to Lincoln Hall (now part of Portland State University) in 1912. Construction began in 1950 for Lincoln’s current Goose Hollow location. The building can be seen at far right in the illustration from Vintage Seattle. VP fan Bart commented on last Friday’s post of Goose Hollow that the Lincoln High School site was once the Kamm estate. 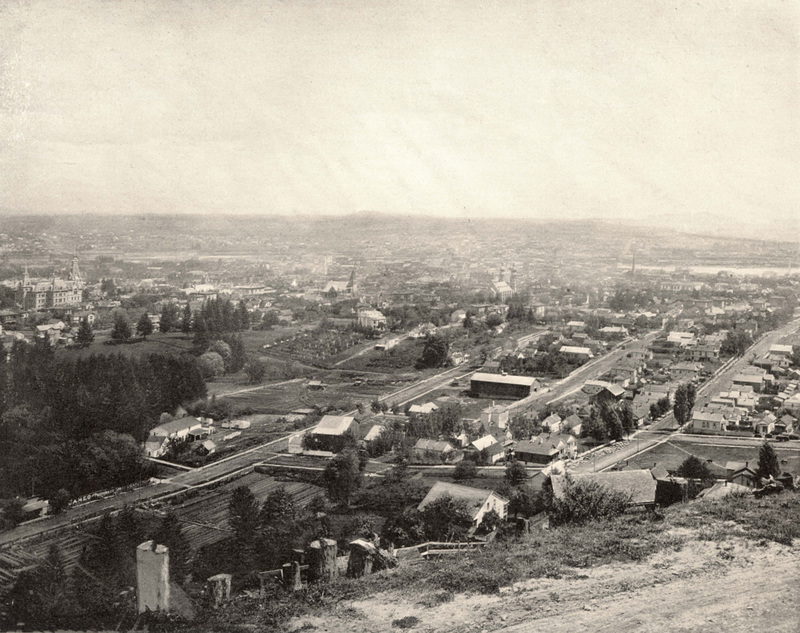 Here’s a photo from much the same vantage point showing the area in 1894. The Kamm house is the big white building in upper center. To the right of that in the distance is the twin-spired Temple Beth Israel. There’s also a two-story home (center, just below the long barn) that still stands on the corner of SW 17th and Columbia. The main street going off to the lower left is Jefferson. Anyone know what the big building off to the left is? There is a surprisingly large number of these buildings still standing in the area of the 18th Avenue Circle where it meets SW Jefferson and Columbia at Goose Hollow. The Lincoln High School athletic field is under construction beyond the row of houses at center left, and the First United Methodist Church will fill in the lot in the immediate foreground. Note The Curtis at upper far right. 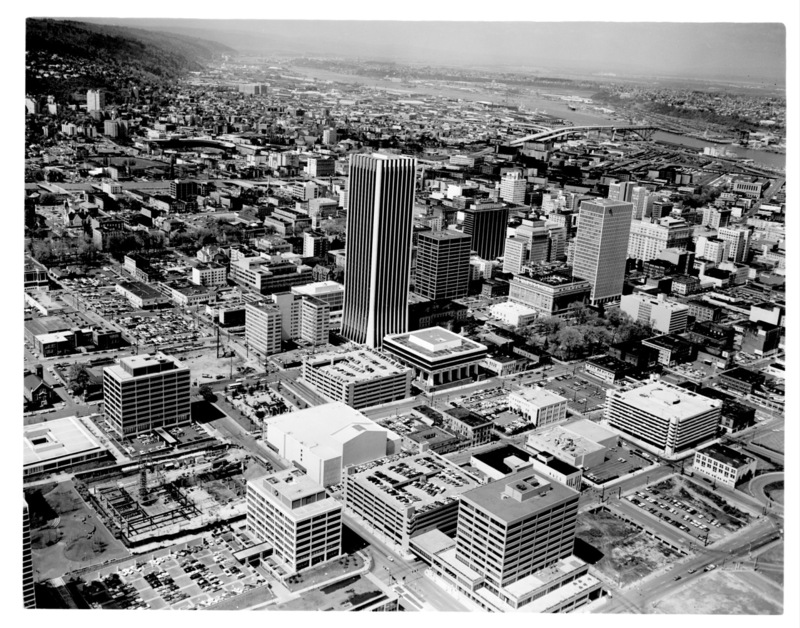 The First National Bank tower (now Wells Fargo Center) was brand new when this photo was taken in 1972. It is still the tallest building in the state at 546 feet. This view is to the northwest. 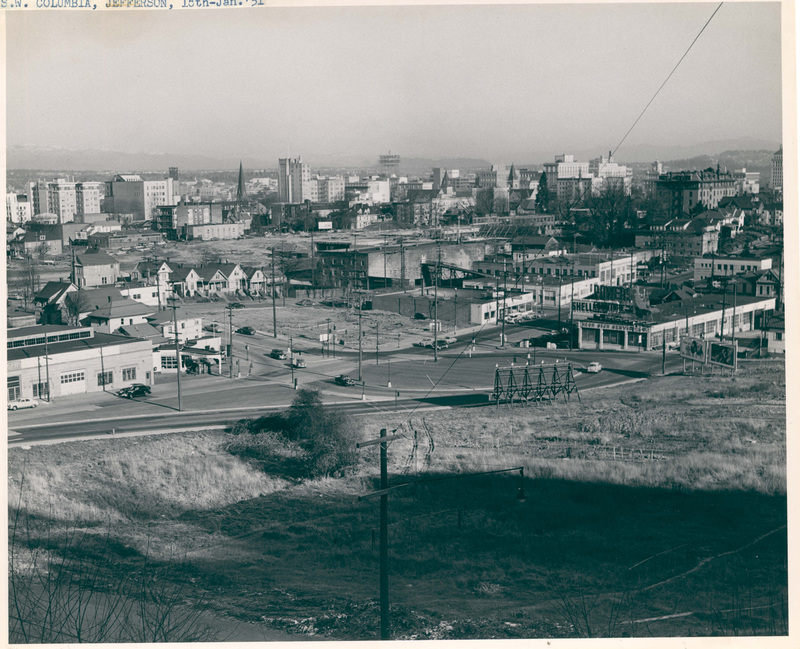 Note that the center span of the Fremont Bridge in the distance at upper right is still not in place.